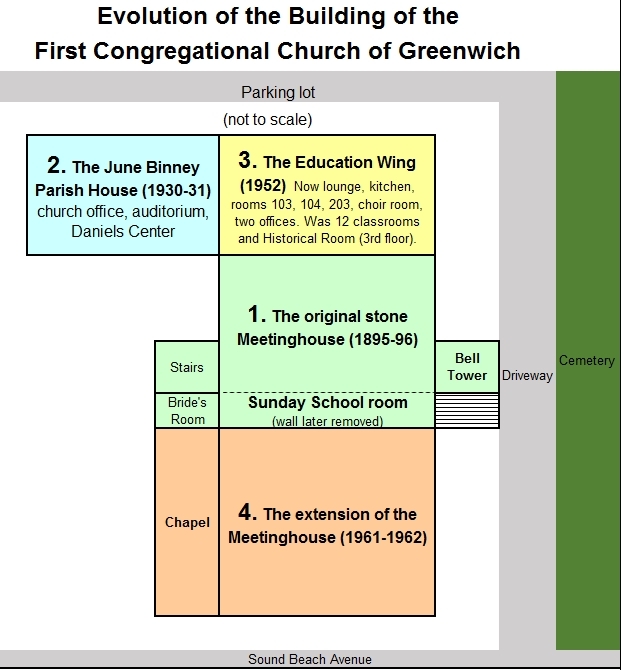 This schematic is not to scale, but shows the four major parts of our church building and the years when each was built. 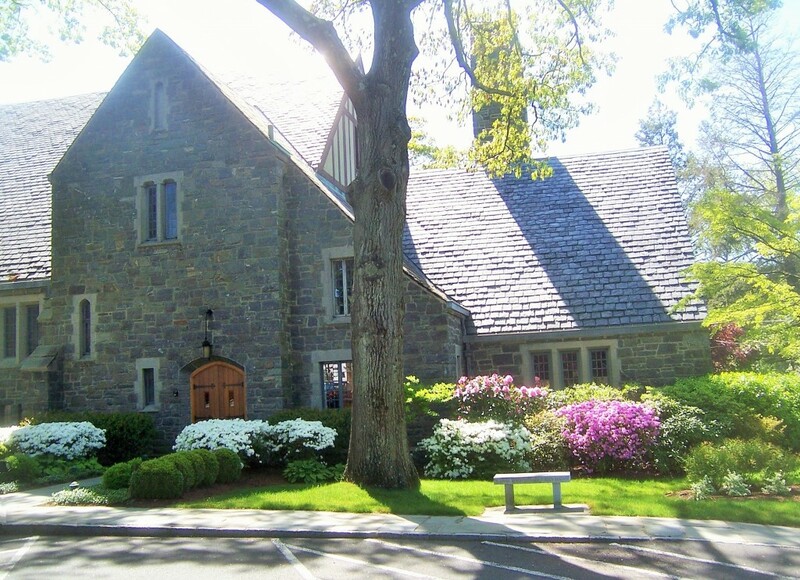 The original stone meetinghouse (shown right) was built in 1895 with the main entrance stairs on the Sound Beach Avenue side of the Bell Tower. In those days the Bell Tower had only one bell. There was a Sunday School room attached to the meetinghouse, with a sliding glass door. 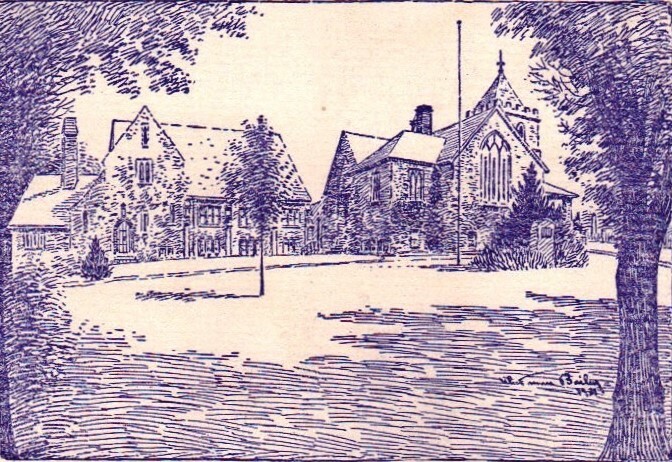 After the June Binney Parish House was completed in 1931, the wall for the Sunday School room was removed so that the meetinghouse could seat more people. Sunday School classes were then held in various rooms of the Parish House. During the baby boom classes for 7th and 8th graders were held up in the Bell Tower (at the level below the bells)! There was a permanent staircase in those days going up into the Bell Tower. That staircase in the foyer was replaced by a pull-down stairs from the ceiling of the Bell Tower foyer when the meetinghouse was expanded in 1961-62 and the outside stairs shown in the diagram and photo on the right were replaced by the current stairs on the driveway side. The Edwin Binney family generously funded the June Binney Parish House as a memorial to their son Edwin Binney, Jr., nicknamed “June”. Its cornerstone was laid in 1930. Most of its rooms became Sunday School classrooms. It housed the first kitchen, so all dinners were held downstairs in what we now call the Daniels Center. During the baby boom the auditorium was divided into Sunday School classrooms. The door to the church office faces the parking lot. A charming half-timber effect in the peak facing Forest Avenue can still be seen. The same design on the other end of the Parish House was blocked from view when the Education Wing was built right next to it. The Parish House and office door as seen from the parking lot. This stucco-covered addition was needed to accommodate our huge Sunday School classroom needs during the Baby Boom in the 1950s. We had about 1000 children in our school, some coming from other churches who had no such facilities yet. 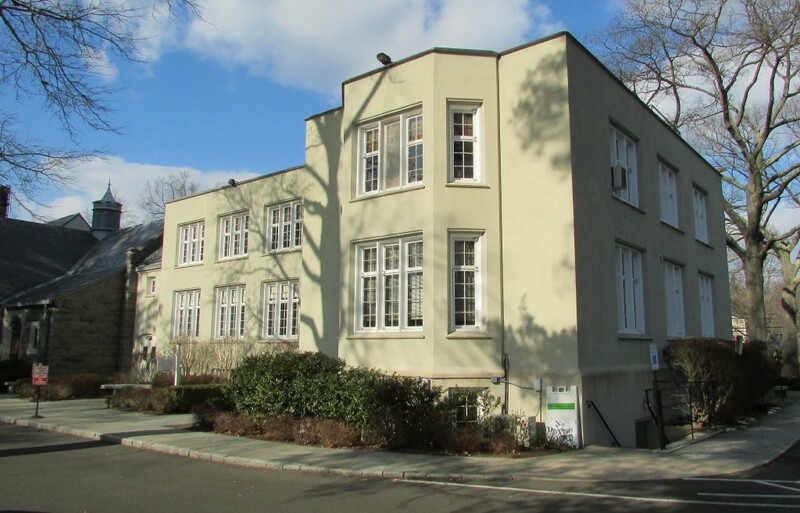 Once the Baby Boomers grew too old for church school, that flat-roofed part of our building evolved into meeting rooms, offices, a lounge, a new kitchen where two classrooms used to be, and a choir room and two offices on the top floor. Even the choir room had been partitioned into three classrooms in the 1950s. Because church membership was expanding greatly under Rev. Dr. Vincent Daniels, the meetinghouse itself needed expanding. After years of major fundraising, the addition to the meetinghouse was completed in 1962. The pews were turned around 180 degrees so that they now face the Sound Beach Avenue side of the building, and many new pews, stained glass windows, Bibles and hymnals were donated via generous Memorial Gifts. 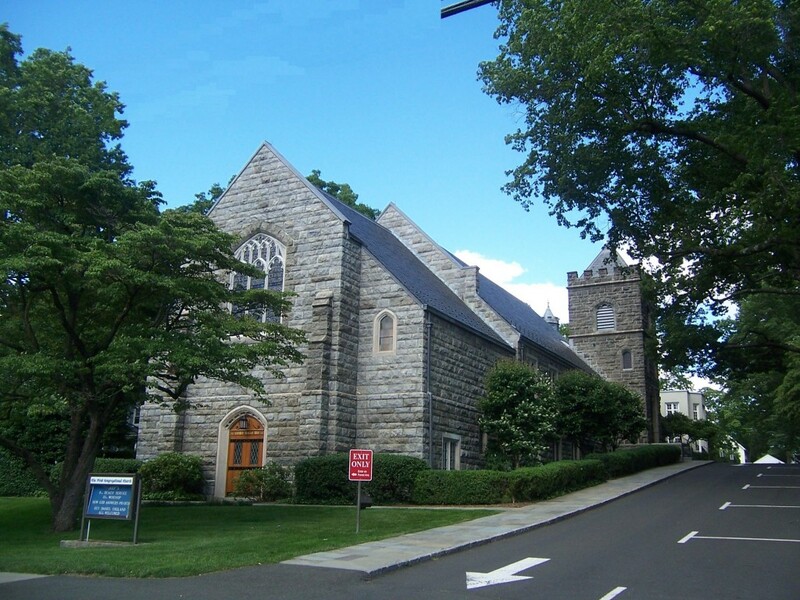 Percy Letts, a trustee at the time, bought stone that matched our existing stone exactly from the Presbyterian church being torn down in Stamford to make way for I-95 being built. 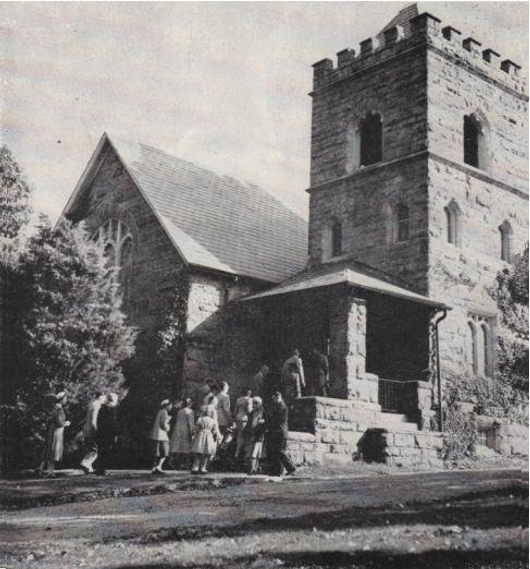 The main entrance to the church was moved from the Bell Tower to what had been the front of the meetinghouse to what is now the back.